One of my favourite foodie countries in Europe is Portugal. From Oporto to Albufiera, from sunny beaches to golfing, the country has got it all. Earlier in the year, Heather highlighted some of the tasty meals in Lisbon, but I’d like to tell you about one thing I can’t get enough of in Portugal: their egg-y treats! Due to a varying number of historical events, you’ll see that beyond an omelette, you rarely see eggs in any Portuguese meal, except for dessert. 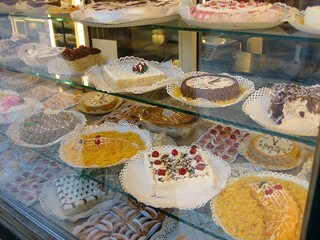 Here are a few favourite desserts – be sure to try at least once during your trip! Where better to start on our egg trail than pasteis, which is one of the most well known confections. 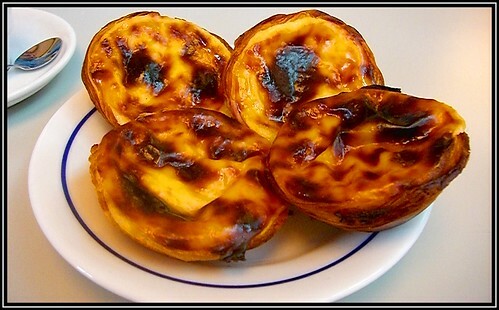 These cup-shaped egg tarts are famous in Lisbon, as well as in former Portuguese territories abroad like Macau. You’ll find them everywhere, but the best they say are the ones from older establishments, such as Pasteis de Belem. They go down very well with a hot cup of coffee, and I say you can have them any time of day, or do what I did: have some for breakfast then try another venue for a mid-afternoon snack. You’ve got to figure out who’s got the best tarts, right? Trouxas look somewhat like a folded pastry, golden yellow – but really this is all just egg yolk and sugar. Sometimes you’ll see them in the bakery and they’re shaped like little sticks, a more congealed outer shell with a softer inside. They’re sweet, sticky, and delicious. I love fios de ovos, for no other reason than it looks like the moppy yellow hair of a rag doll! It’s super yummy and fun to eat, especially for the kids. This treat has been exported and you’ll find it in far off places such as Japan, Thailand, and Brazil. In Portugal it’s normally eaten by itself, but some hotels and high end restaurants do pair it with other things like fruit, ice cream, or cake. Yummm. This is more typically a Christmas dish, served up often like a cake moulded into the shape of a lamprey (a type of fish). The cake is basically a combination of the egg tart filling with angel hair. It’s super sweet and definitely for a special occasion. The tradition of doce de ovos (“sweet of the egg”) comes from a Portugese town called Tentugal, and the recipe is over 500 years old, proof to me they’ve cracked it. The insides are no surprise – egg, sugar – but the difference is that the yummy stuff is wrapped in a thin sweet of dough. The story goes that the nuns in the convents who were responsible for creating many of these sweets would take a massive lump of dough (as big as they could get, by the sounds of it), and then rolled it out on the floor. It was fully stretched when you could read a newspaper through it – one only hopes the floor was clean and there wasn’t a newspaper present! You can find this snack in most bakeries in the bigger towns.